As recently as one year ago I didn’t own any colored denim. None. Zip. Zilch. Nada. Jeans were meant to be BLUE! That’s why they are called blue jeans! But then I joined a style challenge and the shopping list included black jeans! The next one included grey jeans. Then I bought red jeans. And now I’m a convert. A blue jean outfit looks completely different with red jeans. So let me take you on a tour of some possibilities. The hottest color this fall season is “marsala” aka burgundy, wine, maroon. Heck, you could even try plum! I’m on the lookout for some in my price range (read: cheap). Here are a few outfit examples. I love the polka dotted shirt! Navy and burgundy(/wine/marsala/maroon) look so good together! So any kind of navy top would work: sweater, long sleeved tee, striped tee, blazer. This same gal also styled the burgundy jeans with grey. I like how those go together too! Again, think blazer, sweater, long sleeved tee, button down shirt. I have a grey polka dotted top that would look good with burgundy! Rather than a dark color on top, like navy or grey, a light color looks bright and warm. I like this cream colored sweater paired with the burgundy. White or even a light blush would all look good. 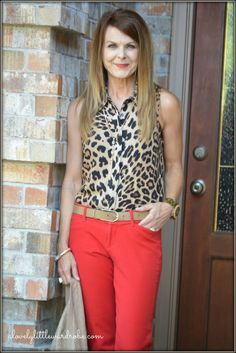 If you love leopard as much as I do, then you can take it one step further and add a leopard top to the red jeans. I am looking for a top like this one because I LOVE this look! If burgundy and red look good with white and navy then green does as well. These pants would look equally good with a navy blazer and white shirt or a cream fisherman’s sweater. Mint is a variation of green and it also looks good with navy and white. I love the pattern mixing of the polka dots and the stripes in this outfit. Olive is another green and it looks great with denim shirt (again with that green and blue!) The touch of leopard elevates the look from casual to chic. You don’t have to have jeans. I don’t have olive jeans but I do have a patterned pixie pant that would sub well. If you don’t care for jeans or pants then think about how you could sub some of your favorite bottoms. Do you wear colored skirts? Or are they all in the same color (black, blue, brown)? Do you have any colored denim? How do you style them?